The human history of La Junta de los Rios began to unfold long, long ago, probably thousands of years before the first written accounts were set down by Cabeza de Vaca and his companions after their visit in 1535. So long ago that archeologists haven't yet discovered the traces that must remain hidden deep within the massive floodplain terraces that line the river valleys. Instead, archeologists have been drawn to the compelling story for which there is diverse, readily visible evidence: La Junta village life. Once village life took hold, it has persisted ever since, although there may have been short-lived breaks. Based on the data we now have in hand, the first villages seem to have been established around 800 years ago. We think it likely, however, that evidence will come to light one day that farming peoples began to settle down at La Junta hundreds of years earlier, as they did in so many places across the American Southwest. Nonetheless, by around A.D. 1200 at the latest, La Junta occupied what can legitimately be characterized as the southeastern frontier of the American Southwest. Small farms were established along the naturally irrigated low-lying floodplains of the lower Río Conchos and the Rio Grande in the valley where the two rivers join. The part-time farmers lived on higher terraces overlooking their crops in semi-permanent pithouse villages, including at least one that contained a small five-room adobe pueblo closely resembling those made in the El Paso area. To the village life mix we should add another characteristic La Juntan pattern: interactions with other peoples near and far who often had different lifestyles. Throughout its known human history, La Junta functioned as a cultural junction as much as it did as a hydrological and ecological junction. It is clear that during the early centuries of village life, La Junta was connected to the larger and more sophisticated Southwestern cultures up the Rio Grande to the northwest and across the desert to the west: Jornada Mogollon and Casas Grandes. Yet La Junta was also a settlement zone to which nomadic hunting and gathering peoples were drawn and were part of. In ways we do not yet really understand, early village life at La Junta seems to have been dependant on both its connections to outside complex sedentary societies as well as to the traditional mobile societies of the eastern Trans-Pecos and northern Mexico. La Junta truly was a cultural junction, a crossroads at which and through which dissimilar societies interacted throughout its known history. The origins of the La Junta pattern—farming, village life, and social interaction—are still debated. So are the ethnic identities of the native peoples encountered by the Spanish as they began to claim La Junta for their own. Who was who, and how did they relate to one another, to the archeological record, and to the later historical record? The continued debate among historians, ethnohistorians, and archeologists may seem ironic in view of the fact that the 16th to 18th century ethnohistoric record of Spanish-Indian relations at La Junta is richer than that for most other places in Texas. But the extensive, yet often difficult-to-interpret documentary record allows us to glimpse a particularly dynamic and complex set of cultural interactions that we will never be able to fully unravel. For the Spanish, La Junta was a fixed point on the remote landscape of the northern frontier of New Spain, a place remarkable for its river junction and as a settlement center where native peoples could always been found, for good and naught. But the Spanish were never drawn to La Junta for its economic potential, its nearby mountains had no silver and its farmlands were simply too far from the nearest major Spanish settlements some 150 miles up the Río Conchos. Instead the European colonists were drawn to native settlements of La Junta as a source of three things: converts, workers, and information. For Spanish missionaries, La Junta was a concentration of heathen souls ripe for conversion to Christianity. For Spanish commercial interests, La Junta was an irresistible source of labor, especially for slaves that could be forced to work the silver mines of Nueva Viscaya. For the Spanish military (and the clergy), La Junta was a ready source for information about the province of Tejas (Texas), especially news about two societies that lay some 500-700 miles to the east: the powerful Caddo chiefdoms of the pineywoods of east Texas and the French intruders and competing colonists on the middle Texas coast and farther east in Louisiana. Spanish accounts show that La Junta was indeed a major cultural crossroads for native peoples during the 16th-18th centuries. According to the Spanish, a great many different named groups are said to have lived at or visited La Junta between 1535 and the late 1700s. During this two and a half century span of recorded time, there are many major gaps during which the Spanish either did not visit La Junta or left little or no surviving written trace. Thus it is unsurprising that scholars have struggled with sorting the identities, contemporary relations, and historical relations among and between these native groups. The Patarabueyes and the Jumanos were links in the great aboriginal trade network which was certainly responsible for the exchange of not only trade commodities, but of ideas as well, between widely separated peoples of diverse cultural affiliations. In his 2007 book La Junta de los Rios, Jefferson Morgenthaler categorizes the diverse Indian nations linked to La Junta in Spanish accounts into three clusters. He distinguishes between the settled La Juntans, those equivalent to Patarabueye as used by Kelley and Kenmotsu; transient groups, the seasonal visitors and the non-farmers who sometimes settled at La Junta including the Jumanos, the Cibolos, and the Cielo complex peoples; and nomads, those nomadic groups who visited or raided La Junta, but that never willingly settled there such as the Chisos, Conchos, and Apache. La Junta's role as a cultural crossroads for diverse native peoples continued throughout Spanish Colonial times. While the alliance network among farming and foraging peoples may have been mutually beneficial, the confluence settlements became caught in an inextricable vise between the Spanish and the mounted raiders from the Southern Plains-Apache and then Comanche groups. This led to the on again, off again relations between La Juntans and the Spanish. When Spanish slavers raided La Junta in the 17th and 18th centuries, the native peoples joined with allies who lived mainly to the south and rebelled against the encroachments by the Spanish Crown and Church. On several occasions La Juntans killed missionaries and forced into retreat the small Spanish forces sent to La Junta. Yet at other times native peoples associated with La Junta, especially the Jumano under Juan Sebeata, used the guise of religion to lure the Spanish to come to La Junta and establish a presence to oppose marauding Apaches from the north. La Junta Native populations declined precipitously from Spanish estimates of upwards of 10,000 in the late 16th century to only a few "Indios" listed in Spanish records by the early 19th century. This is not to say that Indian heritage disappeared entirely. Spanish and Indians intermarried at La Junta and even more so in the Spanish settlements farther south where many La Junta natives migrated in the 18th century to work on farms and escape the hostilities on the northern frontier. The last two centuries of La Junta history, during which the area has become divided by the international border between Mexico and the United States, is better known. Jefferson Morgenthaler's 2004 book The River Has Never Divided Us is a particularly compelling account. He explains how La Junta has remained a place apart, an agrarian community on both sides of the U.S.-Mexican border in a remote setting where life remains linked to the three-pronged desert oasis formed by the two rivers. Being archeologists, we now turn back to the La Junta we seek to reconsider, the unwritten history of the first villagers and those who first came in contact with the Spanish. Below we discuss several major unresolved interpretive problems, highlight the results of ongoing new research, and outline some of the promising research directions that remain to be taken. Origins of La Junta Village Life? Two competing hypotheses have been advanced to explain the origins of village life at La Junta, colonization vs. indigenous development. But these seemingly opposing explanations may not be as contradictory as they sound. The cultural crossroads notion offers an interpretive path that combines elements of both models and points to research needs. Beginning in the late 1940s J. Charles Kelley theorized that the La Junta phase agriculturalists were Jornada Mogollon colonists from the El Paso area of West Texas, implying both an ethnic and cultural linkage. He cited the presence of a single, near-surface tier of adobe-walled rooms, a small "pueblo" in Southwestern terminology, at the Millington site along with an abundance of El Paso Polychrome pottery at La Junta phase sites as evidence in support of the colony idea. He strengthened his argument in later publications. As he put it in 1990, writing with his colleague and wife, Ellen Abbott Kelley, "between about A.D. 1250 and 1300 this El Paso phase complex spread rapidly down the Rio Grande to below Redford." Kelley, however, long recognized that the stone tool technology of La Junta phase peoples may have originated with earlier Big Bend cultures such as the Livermore phase peoples. 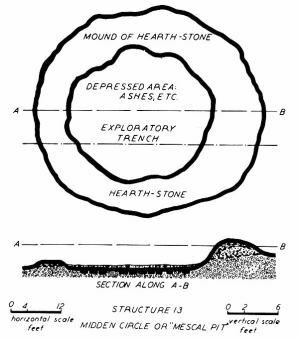 As he and his colleagues Donald J. Lehmer and Thomas N. Campbell put it in 1940: "the Livermore focus [phase] is the typological ancestor of the Bravo Valley aspect, and modified Livermore focus types of projectile points occasionally occur in La Junta focus [phase] sites." In a later, 1957 article Kelley further emphasized this relationship, stating "there is some evidence that the Livermore Focus may have been one of the cultural elements that entered into development of the La Junta Focus of the Bravo Valley Aspect." 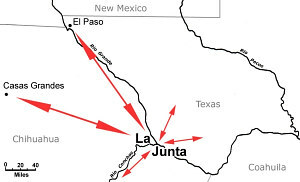 In his final published refinement, Kelley argued that the La Junta phase "essentially represents an isolated colony of the El Paso phase of the Jornada Branch of the Mogollon" and that the La Junta sites "were procurement stations producing surplus local plant foods (especially mescal and mesquite beans); bison skin and dried bison meat obtained from Plains groups trading at La Junta; and were extractive areas for minerals and stones; all supplying the needs of the great redistribution center of Casas Grandes." Put together, Kelley's evolving interpretive model suggests that an El Paso phase colony was established by A.D. 1250 at one or more of the La Junta villages by new peoples moving down the Rio Grande to the Río Conchos confluence. The colony flourished through marriage and other interactions with existing local peoples, including those who followed the Livermore phase. The resulting distinctively La Juntan culture became linked to Casas Grandes through social interactions that led to extensive trade relations. 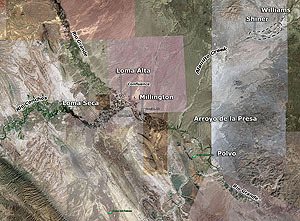 Kelley suggested that La Junta may have served as a satellite of sorts-its people presumably obligated to supply various goods to Paquime (Casas Grandes), the great redistribution center and "capitol" of the most powerful and influential society in the southeastern part of the American Southwest between A.D. 1200 and A.D. 1450/1500. Robert J. Mallouf has put forth an alternative hypothesis to account for the origins and nature of La Junta phase village life. In a 1999 article, he suggests that "La Junta phase peoples may originally have been a hunting-gathering society indigenous to the Chihuahuan Desert region (or intrusive into the Trans-Pecos from the Southern Plains) that, through social interaction, merely adopted certain architectural, agricultural, and other traits of Jornada Mogollon peoples of the El Paso region." 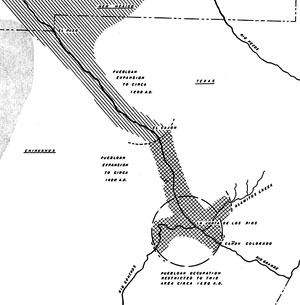 Mallouf points to strong parallels between the La Junta phase and the contemporary Antelope Creek phase in the Canadian River area of the Texas Panhandle. He suspects that the origins of both cultures were the result of hunting-gathering societies entering into symbiotic trade relations with puebloan cultures. By "puebloan cultures" he means the various sedentary village cultures of the American Southwest, including the Jornada Mogollon, who, collectively, are believed to have been ancestors of today's Pueblo peoples. Mallouf suggests the "symbiotic trade relations" in both cases may have been "based in large part upon bison products" (hides and dried meat) provided by the hunting and gathering peoples presumably in exchange for good relations as well as agricultural products, pottery, and ritual items. Although today we tend to think of trade as a "this for that" business relationship, for native peoples the relationship was primarily social. Alliances formed between sedentary agricultural societies and semi-sedentary hunter-farmers, gave both groups access to more diverse food sources, particularly critical during times of crisis such as crop failure and prolonged drought. The spread of influential religious ideologies probably also factored into many social relationships we perceive as being based on "trade." In Mallouf's model the local (indigenous) hunter-gatherers retained certain elements of their traditional lifestyles, seen archeologically in the continuity in stone tool assemblages, earth ovens, diet, and gender preferences in mortuary traditions. Yet, they adopted village life, agriculture, and pottery through close contact with the sedentary puebloan cultures. Like the Antelope Creek peoples, La Juntans learned to build semi-permanent houses. But these were not direct copies, instead they were local adaptations inspired by how the more experienced sedentary peoples built their villages. As Mallouf puts it, "differences in ethnic roots and socioeconomic systems are reflected archeologically in their respective bastardization of Puebloan architectural styles." Instead of learning to make their own pottery, La Junta phase peoples "obtained their wares almost exclusively through trade with sedentary peoples of the Río Conchos and Casas Grandes in northern Chihuahua, and with the Jornada Mogollon of the El Paso region." As Mallouf sees it, La Juntans "never fully made the transition to a sedentary, agricultural-based existence." Instead, they lived in villages only part of the time "with continued strong reliance on hunting and gathering as a means of supplementing their agricultural stores." In both models, colonization and indigenous development, the impetus for the villages at La Junta is seen as being derived from the Jornada Mogollon. All acknowledge the architectural parallels and the presence of abundant El Paso pottery. But how do we tell the difference between new peoples moving into the area and simply the diffusion of new ideas? What archeological evidence could we look at to evaluate these hypotheses? These questions are much easier to pose than to convincingly answer. Comparisons among archeological data from the La Junta, Jornada Mogollon, and Casas Grandes areas are intriguing. If Kelley is right, we would expect the initial El Paso phase colonists to have brought their architectural tradition with them relatively intact. Kelley thought this was the case and pointed to the small adobe pueblo at the Millington site which he believed to be the earliest structure excavated there. Upon closer examination, however, the pueblo contains a mixture of construction elements, some quite similar to structures of the El Paso phase and others distinctly different. The close similarities include the facts that the pueblo has an east-west long axis, puddled adobe floors and walls, and connected rooms with common walls. As is usually the case in El Paso phase construction, the rooms of the small pueblo at Millington seem to have been added gradually, one by one instead of being built all at once. The architectural differences include the use of small pole supports in portions of the walls, a somewhat haphazard arrangement of other pole supports, and placement of the structure within a shallow pit. 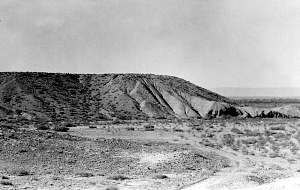 El Paso phase pueblos are typically built directly on the surface, where as the one at Millington was built within a shallow pit about 45 centimeters (18 inches) deep (contrary to Kelley's published characterizations of the pueblo as a surfacial construction). One thing for sure is that the La Junta pueblo is not made anything like the room-block houses at Casas Grandes, which were constructed quite differently. So, the Millington pueblo does indeed contain what Mallouf described as "bastardized architectural features and construction techniques." But does this really rule out the colonization model? We might expect that the colonists would have had to adapt what they knew to local circumstances-somewhat different locally available construction materials for instance. Let's consider other kinds of evidence. The osteological research summarized in New Insights shows that La Juntan villagers were not pure farmers. In fact, maize seems to have been a relatively minor component of a diversified diet that included wild plants and animals. This finding seems more consistent with the indigenous development model, although transplanted Jornada Mogollon colonists may have had no choice but to adapt to local conditions. While wild plants and animals also contributed to the Jornada Mogollon diet throughout the El Paso phase, there is a dramatic difference in stable isotope values between the two regions, placing the Jornada Mogollon population firmly within the realm of maize agriculturalists, while the La Juntans fall well outside of this category. Early Spanish accounts clearly describe the importance of mobility and wild plants and animals to La Juntan life. The skeletal evidence of trauma and arthritis consistent with high mobility among La Junta phase males also supports the idea that the villagers had always depended on hunting and gathering to a significant extent. 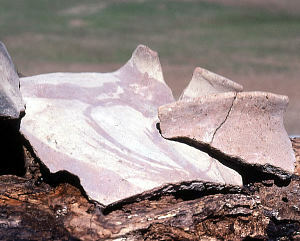 The results of Kenmotsu's nuclear sourcing (INAA) study and petrographic studies of La Junta pottery show that El Paso Polychrome, the dominant La Junta phase pottery, was indeed made in the Jornada Mogollon heartland. So what does this tell us about La Junta origins? It confirms the strong connection between Jornada Mogollon peoples in the El Paso area with La Juntans, but does not really help us choose between colonization and indigenous development. If an El Paso phase colony had been established at La Junta, one would expect the colonists to have brought with them a supply of El Paso Polychrome pottery, the dominant ware in both La Junta and El Paso phase occupations. Yet, it would seem likely that colonists moving from an area where pottery had been made for centuries would soon start making their own version of this distinctive ware. According to Kelley, pottery making did not begin at La Junta until after A.D. 1500 during the Concepcion phase. The ceramics produced at that time were strikingly different from the El Paso wares and clearly represent a completely different tradition. The established fact that most La Junta phase pottery was imported from the Jornada Mogollon and other Southwestern cultures does not contradict the indigenous development model. Part-time villagers who still relied on a mobile lifestyle for part of the year may have been quite content to accept pottery from others. The mortuary practices at Millington and other village sites in the La Junta archeological district provide another line of evidence relevant to the question of the origins of La Junta village society. 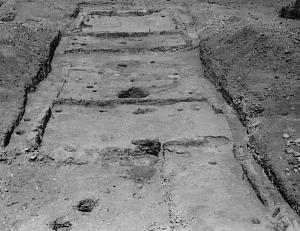 The typical La Junta pattern of placing most interments below structure floors, and less frequently in middens, differs from mortuary practices in the Jornada-Mogollon region. Interments in the Jornada-Mogollon region are usually separated from habitation sites, and were only rarely placed beneath house floors. The individuals are positioned on the right or left sides, or upright, while La Junta village interments usually contain individuals placed in a supine flexed position, or less commonly on the side. Given the demonstrated conservatism in mortuary practices in all cultures of the eastern Trans-Pecos, these fundamental differences between the two regions strongly suggest that the La Junta village development is not derivative of the Jornada-Mogollon cultural area. Taken together, the available evidence seems to us to fit the indigenous development model much better than it does the colonization model. But keep in mind that it may not be an either-or proposition. That is, village life at La Junta may have been established by local hunting and gathering peoples who were inspired, informed, and partially supplied by established societies like the Jornada Mogollon to which they were connected through trade and social interactions. Sorting out social relationships, the movement and identities of specific groups, timing, and cause and effect in the development of the La Junta cultural crossroads is not yet possible. Frankly, most of the evidence we now have is circumstantial and equivocal, and it comes from archeological data recovered long before the advent of modern archeological and analytical techniques were developed (e.g., radiocarbon dating). To really evaluate and fine-tune the models we need better data: tightly dated structures, closely associated, well-documented artifact assemblages, and multiple lines of scientific evidence. Kelley originally thought that village life at La Junta represented a virtually unbroken 600-year cultural tradition from A.D. 1200 to 1800. But in later years he argued that there was a hiatus, a period of abandonment, that he calculated may have lasted a century or so after the La Junta phase, which he thought ended around A.D. 1400/1450. Kelley suggested that severe drought and the collapse of the Casas Grandes culture left "the area occupied only by semi-sedentary hunters and gatherers living in simple structures." He pointed out that in 1535 the Cabeza de Vaca party "found the Indians there growing corn and beans and gourds and living in a sort of house, but making no pottery." Not long thereafter, according to Kelley's chronology, the Concepcion phase began during which pottery was made locally and houses were made somewhat differently. He thought these changes represented new peoples moving into the area from farther south up the Río Conchos. Mallouf agrees with Kelley that La Junta lifeways were altered after collapse of Casas Grandes and the onset of severe drought, but he does not think the area was abandoned, pointing to the continued occupations of Cielo complex sites such as Cielo Bravo just a few miles away. He thinks La Junta peoples reverted to full time hunting and gathering around A.D. 1450, which he does not think is surprising because "La Junta phase peoples were practicing a semi-sedentary, rather than sedentary, existence to begin with." In essence, Mallouf thinks that the early farming peoples of La Junta and the hunting and gathering peoples of the contemporary Cielo complex were interrelated by shared ethnicity and languages. Those who lived in the La Junta villages may simply have abandoned farming during prolonged droughts and spent more time foraging and moving seasonally than before. The actual archeological evidence of a period of abandonment at La Junta seems to come down to a single architectural sequence that Kelley documented in one area of Loma Alta. This is not much on which to base an argument for a major period of abandonment of the La Junta area. There are many more continuities than discontinuities in the archeological record. Apart from the apparent beginnings of pottery making at La Junta during the protohistoric Concepcion phase (and the introduction of some items made in Europe or Mexico), the artifact assemblage remains little changed from the pre-contact La Junta phase. While houses become larger, the same structural forms are made using the same construction techniques. Clearly more radiocarbon and other data from reliable excavated contexts are needed from the La Junta villages for a clearer understanding of what actually transpired upon the collapse of Casas Grandes and as the result of changing climatic conditions. But it is looking less and less likely that La Junta experienced a signficant hiatus, leaving us with a most unsatisfying understanding of the prehistoric to protohistoric transition. Based on the early written accounts and emerging archeological data, La Junta was a cultural crossroads where farmers and hunters, nomads and villagers, peaceful and aggressive native groups came and went, mingled and traded, celebrated and conspired. It was like no other place in the Trans-Pecos Mountains and Basins. Better understandings will require archeological, ethnohistorical, and historical research as well as related interdisciplinary studies including paleoclimate, paleoecology, and geomorphology, among others. Sticking to archeology, below are some of the key research questions that need to be addressed through ongoing and future investigations. 1) How and when did village life at La Junta develop? Meaningfully addressing this broad question will ultimately require intensive archeological excavations at a series of La Junta sites, including some from along the Río Conchos in Mexico. The Kelley-era investigations were a good start, but we need renewed investigations using modern strategies and techniques. We need to explore the deeply buried terrace deposits in search of pre-A.D. 1200 occupations including possible villages. We also need samples of La Junta phase occupations with tightly dated structures and associated artifact and ecofact (organic remains of plants and animals) assemblages and burials. By comparing these data through time at La Junta and with latest information from both the Jornada Mogollon and Casas Grandes areas we will gain a much better understanding of the origins and development of village life. 2) What were the villagers eating throughout the long-lived history of La Junta? What were the relative contributions of farming, hunting, gathering, and fishing to the diet? To answer such subsistence questions we need to compare human osteological data as well as botanical and faunal remains from the posited pre-village deposits and La Junta phase occupations with comparable samples from Concepcion and Conchos phase occupations. 3) How did climatic conditions and changes affect La Junta subsistence, resource procurement, and settlement strategies? Addressing these issues will require the kinds of investigations and data mentioned above. The same excavations could and should yield environmental data through specialized sampling (such as pollen samples) and by geomorphological studies of the depositional history of both the sites and the overall river valley sequences. The La Junta data also needs to be integrated with existing regional climatic data. 4) What were the trade relationships between La Junta and other contemporary societies during the La Junta phase? Did La Junta supply resources to Casas Grandes? What did La Juntans exchange with Jornada Mogollon peoples for El Paso Polychrome? The trading of materials and exchange of ideas with adjacent cultures through time clearly impacted the La Junta settlements, but the mechanisms, products, and relationships are very poorly understood. Source analyses are needed on obvious trade items including pottery, obsidian, and marine shell recovered from tightly dated contexts in village deposits of varying age. Is there evidence of production-scale desert succulent baking at La Junta? Meat and hide processing? 5) Were La Juntan villages multi-ethnic, housing peoples of varied identities and lifeways from the beginning, or was this only a historic pattern that developed in response to European and Apachean threats? This will require closely comparing well-dated archeological data from multiple La Junta phase sites in the La Junta district including those in Mexico. If these were home to peoples of varied identities and lifeways, we would expect to see patterned differences in artifact assemblages, housing construction, imported artifact sources, and other kinds of data. In contrast, relatively homogenous patterns would imply that early village life at La Junta was established by a single ethnic group. We would point out that we do not expect to find a homogeneous La Junta phase pattern, given the district's geographical extent, local ecological and physiographic variation, and the emerging dietary data. Thus the broad question we really want to ask is: How La Juntan villages compare to one another across the district and through time? 6) What were the nature and extent of the relationships among the La Junta phase villagers with the peoples of the Cielo complex and other contemporary hunting and gathering peoples? 7) When did the La Junta earthenware pottery tradition develop and what are its origins? Did it really not begin until protohistoric times? The La Junta excavation data outlined above should address the dating question. Given the strong early historical connections with groups along the Río Conchos to the south, we suspect the La Junta ceramic tradition may have its origins there. Comparisons are needed, but the dearth of archeological research in this area of Mexico means that basic research is needed. 8) What was the overall La Junta settlement pattern? All we know about so far are a few of the villages—we need to look carefully across large chunks of the landscape on both sides of the border and search for hamlets, farmhouses, special activity areas (such as plant baking pits), distant and nearby resource areas (such as stone quarries), and even fields. With intensive survey, geoarcheological prospecting, remote sensing, and field testing, the overall La Junta settlement pattern(s) could be reconstructed with much greater clarity than we have today. In sum, we archeologists have our work cut out for us! Viewed from the wider perspective of the American Southwest, much of the the archeological potential of the La Junta district has yet to be tapped. Aerial view of La Junta as seen from 7.25 miles above the earth. Base map Google Earth. Large sherds of locally made La Junta pottery recovered from the Millington site by J. Charles Kelley, probably in the late 1930s. This posed photo was taken in the early 1970s by a photographer from Texas Parks and Wildlife using sherds borrowed from TARL. TARL Archives. Throughout its known human history, La Junta was a cultural crossroads where peoples who lived elsewhere and often had different lifestyles interacted within one another. During the early centuries of village life, La Junta was connected to the Jornada Mogollon and Casas Grandes, larger and more sophisticated Southwestern cultures up the Rio Grande to the northwest and across the desert to the west respectively. The early Spanish accounts dating to the 16th and 17th centuries contain many references to connections with peoples who lived upstream on the Río Conchos (to the south/southwest) as well as to hunting and gathering peoples whose territories lay to the north and east. Structure 2 at Millington, an adobe-walled compound with five contiguous rooms dating to the La Junta phase early in the site's history. This multi-roomed compound is similar in many respects to early Jornada Mogollon pueblos around and north of El Paso, which Kelley interpreted as evidence that the Bravo Valley culture may have been established by a colony of Mogollon peoples. CBBS Archives, Sul Ross. 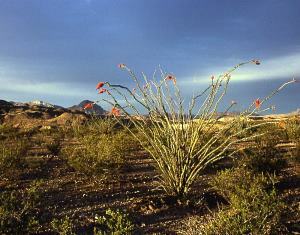 Ocotillo blooms in Big Bend National Park following summer rain. Ocotillo stalks or canes are thought to have been one of the main construction materials used in house construction at La Junta as upright poles in jacal walls. The dried stalks are flexible when fresh and quite strong. They have a honey-combed structure to which adobe readily adheres. Photo by Andy Cloud. 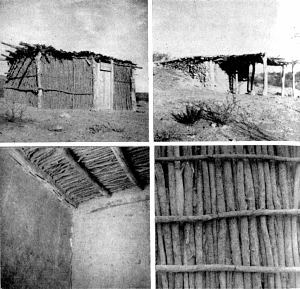 Jacales, simple houses with mud-plastered pole walls and roofs, were still being made in late 1930s in Presidio Texas using the essentially the same materials and techniques used by the first La Junta villagers, some 700 years earlier. From Lehmer, 1939. 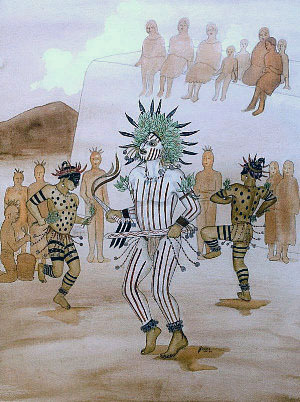 Artist's depiction of a dance scene at a La Junta village similar to those mentioned in the records of Espejo Spanish entrada in 1582. Although somewhat fanciful, especially the large plastered pueblo structure upon which part of the audience sits, such colorful events with elaborate costumes and body painting are plausible and likely elements of village life at La Junta. This 1994 painting by artist Feather Radha can be seen in Restaurante Lobby's OK in Ojinaga, Mexico. Courtesy Elsa Socorro Arroyo. 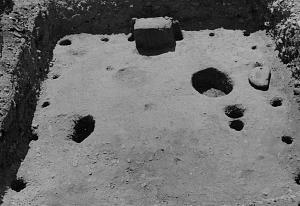 La Junta phase rectangular pithouse at the Millington site with an adobe "altar" on the south wall. Similar features are found in the Southwest and Southern Plains. CBBS Archives, Sul Ross. Aerial view of the Rio Grande looking north just above (upstream) from the Polvo site. 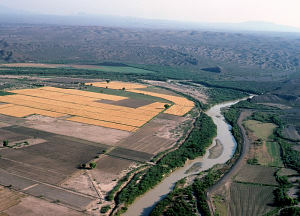 Modern irrigation allows the mechanized cultivation of the wide floodplain on the left in Mexico as well as narrower terraces on the U.S. side of the river. Prior to modern times, farming would have been restricted to much smaller, low-lying areas adjacent to the river where natural irrigation was possible. 1983 photo by Bob Parvin, courtesy Texas Historical Commission. 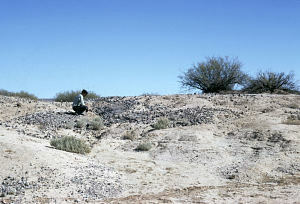 View from the west of the "mesa" or mountain pediment upon which the Loma Alta site is situated. The pediment forms a finger-like protrusion into the Rio Grande valley, offering an ideal village location overlooking the low flat floodplain, yet safely above flood level. Kelley also found evidence of a second Concepcion phase village on the much lower, slightly raised terrace visible in the foreground. Photo probably taken by Kelley in the late 1930s. CBBS Archives, Sul Ross. 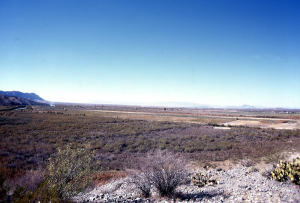 View of the modern floodplain of the Rio Grande just above the Río Conchos confluence looking west-northwest. 1973 photo by Vance Holliday, TARL Archives. 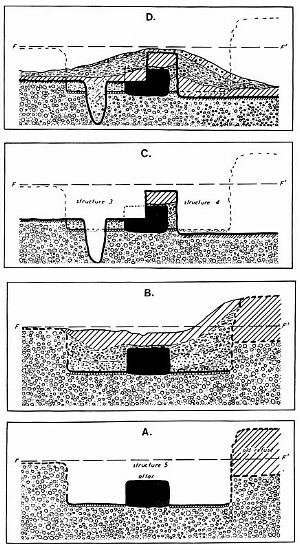 Kelley 1986, Figure 5, original caption: "Sequence of events at the Loma Alta site. A. Structure 5, La Junta Focus, cut into gravel and old refuse of unknown provenance, B. Structure 5 abandoned and refilled with fallen roof debris, gravel, and fine sediment, and at the top by a layer of refuse. C. Structures 3 and 4, Concepcion Focus, cut into fill of Structure 5, destroying part of walls, floor, and altar of Structure 5. D. Structures 3 and 4 abandoned and refilled with washed gravel, silts, and sand mixed with older refuse." 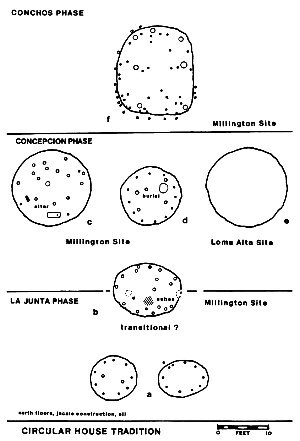 It was this depositional sequence that Kelley cited as the principal evidence for a period of abandonment following the La Junta phase (focus). The inferred sequence of events, however, may have only occurred at this particular place in this particular site. No other compelling evidence of a hiatus has been found at La Junta. 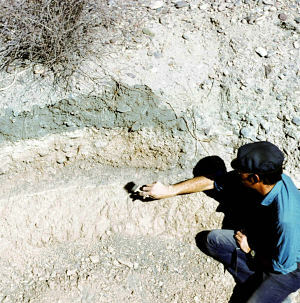 Stratigraphic profile at Loma Alta created by cutting back an arroyo wall during a 1973 survey in advance of a flood control project. The photograph is labeled "midden zone," but the thin white layer that archeologist James Ivey is brushing off could well be a pithouse floor. Regardless, there appear to be two layers with dark organic staining separated by a thick "clean" layer similar to the one described above in Kelley's sequence of events as "washed gravels, silts, and sand mixed with older refuse." Photo by Vance Holliday, TARL Archives. La Junta rectangular house traditions. 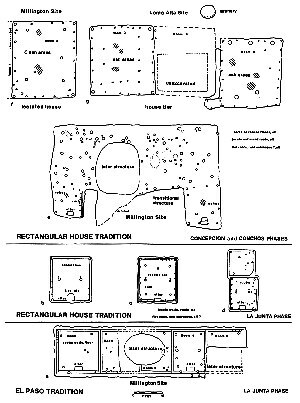 La Junta phase structures include the five-room pueblo at Millington as well as individual and paired rectangular structures known from various sites. In historic times during the Concepcion and Conchos phases the houses are noticeably larger, suggesting they housed multiple families or extended families. From Kelley 1985, Figure 1. La Junta circular house architectural tradition. Similar circular pithouses were built throughout the sequence. The La Junta phase houses tend to be somewhat smaller. Even smaller structures thought to represent granaries also occur. From Kelley 1985, Figure 2. 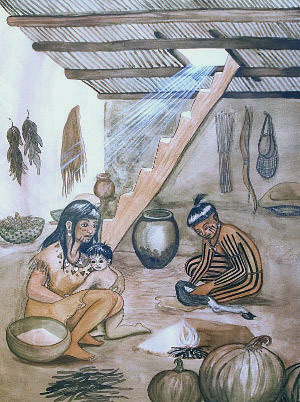 Artist's depiction of the interior of a flat-roofed rectangular house at a La Junta village similar to those described by early Spanish visitors. Although somewhat fanciful, the mix of crops (corn and squash/pumpkins) and wild foods (mesquite beans and what could be the leg of a pronghorn antelope) rings true. This 1994 painting by artist Feather Radha can be seen in Restaurante Lobby's OK in Ojinaga, Mexico. Courtesy Elsa Socorro Arroyo. Map from a 1952 American Antiquity article that Kelley wrote entitled "Factors Involved in the Abandonment of Certain Peripheral Southwestern Settlements." He was trying to explain the expansion and contraction of farming-based settlement as reflected in the archeological record of La Junta. He saw population movement as resulting from "the disturbance of a delicate ecological balance existing between the principal subsistence life zones and the Apache and puebloan peoples of the region." He postulated that severe drought in the first half of the 18th century had confined La Juntan peoples to the immediate vicinity of the river confluence. From Kelley 1952a, Figure 1. This article shows J. Charles Kelley's "big picture" approach—he was a true scholar—a man of ideas who sought to relate his archeological findings to broad patterns of human history, and a man who was not afraid to put forth reasoned inferences in print to be challenged and evaluated with new data and new ideas. Kelley trenched this "mescal pit" at Loma Alta. Also known as "ring middens" or "roasting pits," similar features were associated with several La Junta sites. Based on analyses of similar features at many sites in the American Southwest and the western half of Texas, these almost certainly represent earth oven facilities used to bake mescal (agave) and/or sotol, as Kelley surmised. He suggested that La Junta may have supplied baked mescal (presumably in the form of dried sugary cakes) to Casas Grandes, although there is as yet little real evidence to support this idea. It is perhaps more likely that baked desert succulents were simply part of the La Junta diet, as they were throughout the Trans-Pecos. From Kelley 1986, Figure 9. 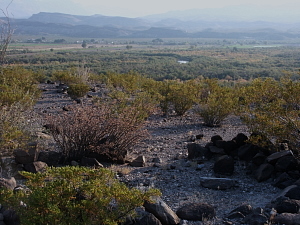 The Cielo Bravo site is one of several campsites overlooking the Rio Grande valley that raise the question: What was the nature and extent of the relationships among the La Junta phase villagers with the peoples of the Cielo complex and other contemporary hunting and gathering peoples? Photo by Steve Black. 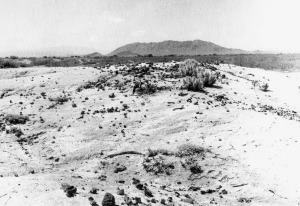 1939 photograph taken by Kelley of the Kopenbarger site (41PS16), a site he believed was occupied in the Conchos phase. This site is one of many La Junta villages that has never been excavated. CBBS Archives, Sul Ross. Thirty-two years later, archeologists revisted the Kopenbarger site (41PS16) and found the same kinds of eroding concentrations of burned rock and debris seen by Kelley. No serious investigations were undertaken, however. 1973 photo, TARL Archives. 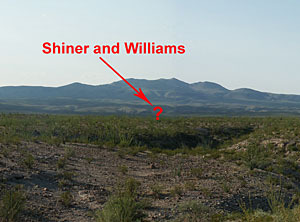 The Shiner and Williams sites were documented, sketchily, by Kelley, Campbell, and Lehmer during their Big Bend survey in the late 1930s. These small villages or hamlets were located along Alamito Creek below the Cienega Mountains northeast of the river confluence some distance. There are probably many other small La Junta settlement features well away from the rivers. This points to the need for settlement pattern studies. Photo by Steve Black.